Aviation art in The Mall! Philippine Airlines back to Europe? 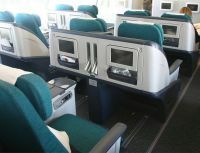 Now seeing the benefits of its commuter connectivity with the UK, Aer Lingus is to add San Francisco and Toronto to its North American destinations for next year. From April onwards the airline will offer all year round flights to both major cities from Dublin. 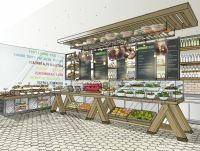 Wondertree, a new casual all day dining concept, is the latest contracted addition to Heathrow’s ‘Terminal 2: The Queen’s Terminal’ which opens next June. Wondertree is a collaboration between The Restaurant Group Plc (TRG) and Giraffe Concepts (Giraffe). The restaurant will occupy over 5,000sq ft with 210 covers and has been designed to take advantage of the airfield view over the UK’s hub airport. Norwegian and Panasonic Avionics Corporation have joined forces to develop the first ever Android-powered in-flight entertainment system. Norwegian’s passengers will be able to use select Android apps that are pre-loaded onto the system, providing an in-flight experience similar to the on-the-ground experience travellers have become accustomed to with their personal devices. Next year could see the return of Philippine Airlines (PAL) to Europe after a break of 15 years. The oldest airline in Asia, first created in 1941, has been removed from a EU blacklist allowing the national carrier to resume flights to destinations in Europe. 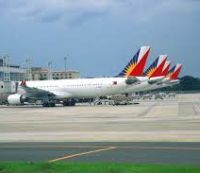 The EU placed a blanket ban on all airlines based in the Philippines in 2010, due to safety concerns. In the latest update of its aviation blacklist however, it said it would allow PAL to resume flights. Air Canada rouge has launched a seasonal non-stop service from Edinburgh to Toronto. Rouge, basically a leisure airline will operate three flights per week from the Scottish capital to its Toronto hub until 18 October. 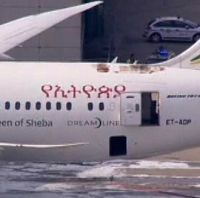 An Ethiopian Airlines' Boeing 787 Dreamliner caught fire last Friday afternoon whilst on a remote stand at Heathrow. It was a very hot day with temperatures over 90°F on the apron. No persons were on board. The airport emergency staff quickly put out and contained the blaze necessitating the closure of the airport for about two hours during a very busy period. 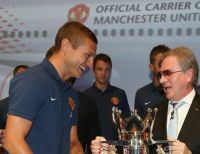 Manchester United has added Aeroflot to its ever growing list of global sponsors. It is the first Russian company to partner with the English soccer champions. Red is official colour of both. 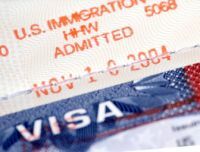 Travellers worldwide who require visas for entry into the United States (and do not meet the ESTA requirement) should be aware that a new application scheme is being introduced from 26 July 2013. US Airways Group has confirmed its shareholders' approval of the merger agreement with AMR Corporation, the parent company of American Airlines, Inc. The revamped airline is likely to stay with oneworld, but whether the controversial AA tail fin design remains is open to conjecture. 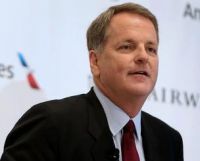 Doug Parker, Chairman and CEO of US Airways, and incoming CEO of the combined company appears not to be in favour. OAG does not officially list Darwin to London these days. Smart bookers and regular travellers will not have any trouble linking up on the screen (and indeed via the mighty printed timetable still available) what was once a popular Qantas/British Airways service. In any event one world member Malaysia Airlines has stepped in and reinstated a route it itself closed back in 2002 to provide passengers, particularly those travelling from the UK, easier access to Australia’s Northern Territory. 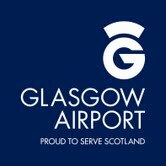 With a 17m investment programme under way to be completed in time for the 2014 Commonwealth Games Glasgow Airport has launched a new logo and accompanying strapline – Proud to Serve Scotland. The airport will be the gateway to the Games and the new emblem is a key part of its extensive preparations. Produced by Paisley-based agency Designline, the logo is a contemporary twist on an iconic Scottish symbol. It depicts the head of a thistle sitting proudly above the letter G and the use of a solid blue colour adds to its distinctive Scottish feel. 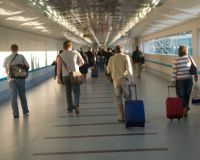 Britain’s airports have been rushing out figures for a record June, which may have had something to do with the terrible weather (people hastening to go away), the extra working day in the month, or the fact last year people were more concerned with the Queen’s Jubilee leading on to the Olympics. In alphabetical order we note the passenger numbers from those airports who have reported so far to Business Travel News. All showed a rise. EasyJet, Britain’s biggest airline, can continue with its plan to buy 135 new Airbus A320s after shareholders backed the deal on Thursday, defeating a move by the group's estranged founder to block it. Sir Stelios Haji-Ioannou's is said to be ready to dispose of a large part of his family’s stake in the carrier he founded with just three Boeing 737s in 1995. Now trading at around £13.50, up from around £2 in 2004, the Haji-Ioannou shareholding could realize around £2bn. Our intrepid traveller Jane Stanbury has been to Hanoi, courtesy of Finnair and its inaugural to the capital of Vietnam, part of a plan to make Helsinki the European gateway to the Far East. 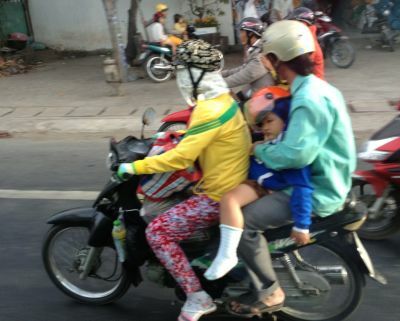 We thought we would try and find a scooter joke to go with the Saigon ON TOUR but were unable to spot one. However we did come up with the following which is sort of related. Emirates now has introduced an interactive aviation experience at the North Greenwich O2 terminus of the Air Line cable car (see BTN 17 June). 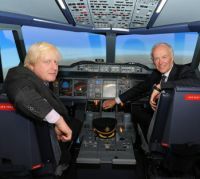 Mayor Boris Johnson opened the attraction, supported by the Dubai-based carrier’s President Tim Clark. Never short of words Mr Johnson said: “The Emirates Aviation Experience is a veritable Aladdin’s cave of technological wizardry and gizmos that will give people of all ages a real insight into the wonders of flying”. Available for anyone to fly is an Airbus A380 simulator and also a Boeing 777. London’s Mall Gallery, situated just behind Admiralty Arch, is the venue once again for the Guild of Aviation Artists Annual Summer Exhibition. British Airways' passengers flying out of Edinburgh until the 24 July can make the use of a experimental check-in service being evaluated by the airline. Contrary to rumours Gatwick Airport is not about to charge for dropping off and picking up passengers at either terminal. 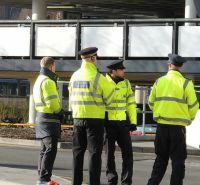 What the airport is doing is ‘encouraging’ drivers to be as quick as possible with regard to their passengers. 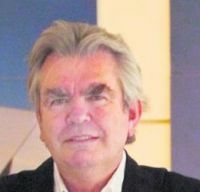 Sir Terry Farrell, one of Britain’s best known architects, has been appointed by Gatwick Airport to provide expert advice on its runway capacity plans. 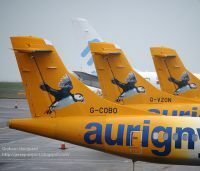 Aurigny Airlines, the State-owned airline of the Bailiwick of Guernsey, says it would need another aircraft if it is to be the replacement for the Flybe Gatwick service. The airline has been owned by the Bailiwick since 2003 and has accumulated losses of £12m. 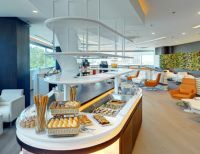 SkyTeam has opened its new lounge at Istanbul’s Atatürk International Airport. The lounge is available to Elite Plus, First and Business Class customers flying from the airport on any of the alliance’s 10 airlines that serve Istanbul.